Moms are you ready to hear about two charming Barbies to add to your early Christmas or birthday list for your daughter? 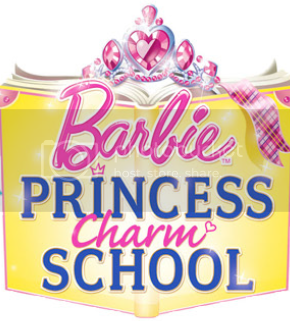 Don’t miss out on getting your hands on what is sure to be one of the hottest new toys out there…Barbie Princess Charm School – Barbie dolls. These beautiful dolls are characters based from the DVD movie Barbie Princess Charm School (movie available this Fall). I recently gave my 4 year old daughter these two princess beauties. First, let me begin by saying that she absolutely loved them! As soon as she saw the pink sparkly boxes that they came in she was so anxious to play with them right away. She couldn’t get me a pair of scissors fast enough so that I could get those dolls out of their boxes for her! The first Barbie doll we opened was Princess Blair. She was dressed in a shimmery pink and fuschia dress. We discovered that Princess Blair transforms into three fashionable looks. First, she comes with a detachable school uniform top that easily clips on and off to transform her from princess to student. Also, located on her backside, there is a wind up knob that your child can wind up easily and Princess Blair’s dress twirls from long to a short fun party dress. Lastly, with the push of a button, her party dress quickly transforms into a full-length princess gown revealing that she is the long lost princess. My daughter just loved how easy it was for her to change Princess Blair’s dress from long to short all by herself. Princess Blair retails for approx. $23.99 – $24.99 at your local toy store. The second Barbie doll we opened up was Princess Delancy, BFF of Princess Blair. Princess Delancy came in a fashionable purple dress with platform shoes, a purse, tiara and her rockin’ side swept belt. Princess Delancy only comes in one outfit but my daughter thought she was just as pretty as Princess Blair. She even commented on how cute her shoes were. You can say my daughter is a shoe lover in her own right. Princess Delancy retails for approx. $16.99-$18.99 at your local toy store. Please keep in mind that these dolls are not suitable for children under 3 years of age, because there are small parts that could be dangerous. My daughter especially enjoyed that the two BFF’s were together and she played with them for hours. She of course invited them for a tea party and showed off her charming manners. Princess Blair and Princess Delancy went everywhere with my daughter – to preschool for show-n-tell, soccer practice while watching her brother, and on playdates. She informed me that one best friend couldn’t be without the other. These dolls are a great addition to her Barbie collection and imaginative play and will be a nice addition to your child’s wish list as well. *Disclosure – The dolls were provided for review purposes and in no way affects our opinions or review.